Cnaeus Domitius Calvinus was Proconsul and Imperator in Spain after putting down the Cerretani revolt. Mint : Osca in Spain. Date : issue of 39 BC. Size : 17.9 x 19.0 mm. Weight : 4.06 grams. Obverse : Male head right, with OSCA behind. This type is copied from the silver drachms issued by the Iberian Celts of Spain more than a century earlier, and was probably intended to appeal to troops raised from that cultural group (see Sear Greek #28, for a similar head but with an Iberian inscription behind). Reverse : Simpulum, sprinkler, axe and apex, with DOM COS ITER IMP below. 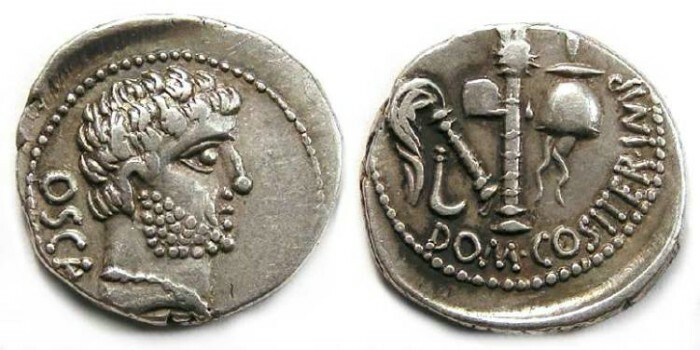 The symbols on this reverse are the emblems of the pontificate (high priest) , and while he probably held that office and had a right to represent them on his coins, the design is almost certainly copies from the reverse of the elephant type denarii of Julius Caesar and also represent his loyalty to the Caesarian side of the civial wars that were on going during this period. Sear, in Roman Coins and their values, only places the value of this type at $560 in VF and $1440 in XF, but recent auction results for this type have been far high than those values. On October 14th of 2002, Gorney & Mosch auction 117, lot 434, a very similar specimen with part of the mint name (osca) off the flan realized 1300 euro's (currently about $1600 US) plus the buyers premium. On January 15th of 2002, CNG auction Triton V, lot #1846, a some what better specimen realized $2200 US plus the buyer premium. Based on these prices realize, we feel our asking price of $1275 US is reasonable for the coin.